Amenities: Gas central heating with woodburning stove. Electric oven, gas hob, microwave, fridge/freezer, washing machine, dishwasher, Smart TV with FreeSat, DVD, CD/radio, iPod dock, WiFi, selection of books and DVDs. Fuel, power and starter pack for stove inc. in rent. Bed linen and towels inc. in rent. Cot, highchair and stairgate on request. Off road parking for 2 cars. Enclosed front patio and small lawn with furniture and BBQ. Two well-behaved dogs welcome. Sorry, no smoking. Shop and cafe 1 min walk, pubs and restaurants 2 mins walk. Ironbridge 5 mins walk. Town: Coalbrookdale is a village set within the World Heritage Site of Ironbridge Gorge. This lovely village is close to the ten renowned museums which celebrate the history of Ironbridge World Heritage Site. 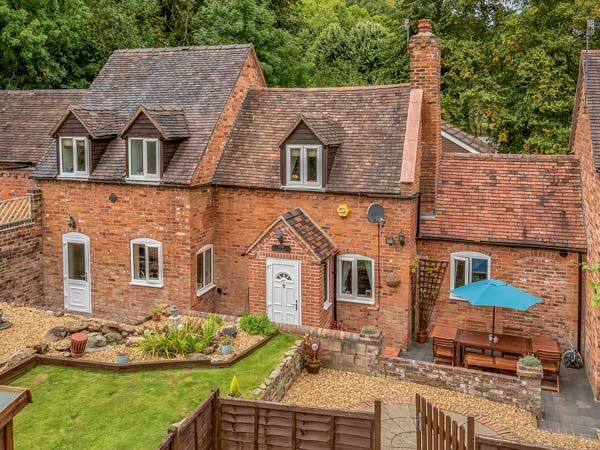 The village is within a 5 minute walk to the centre of Ironbridge village which offers the world famous iron bridge, pubs, restaurants, shops and tea rooms. Within driving distance is the towns of Much Wenlock, Shrewsbury and Ludlow. Gas central heating with woodburning stove. Electric oven, gas hob, microwave, fridge/freezer, washing machine, dishwasher, Smart TV with FreeSat, DVD, CD/radio, iPod dock, WiFi, selection of books and DVDs. Fuel, power and starter pack for stove inc. in rent. Bed linen and towels inc. in rent. Cot, highchair and stairgate on request. Off road parking for 2 cars. Enclosed front patio and small lawn with furniture and BBQ. Two well-behaved dogs welcome. Sorry, no smoking. Shop and cafe 1 min walk, pubs and restaurants 2 mins walk. Ironbridge 5 mins walk.